The question of how much protein should be included in any given dog’s diet has long been debated. One of the main reasons for this is the fact that some people believe diets that contain too much protein can cause health problems. Health problems like weight gain (protein is often high in calories), chronic kidney disease (CKD) and kidney failure. Others believe such a diet isn’t the root of these and other health problems, but rather that it exacerbates existing issues. Another group of people inadvertently think a high-protein diet is best. They believe dogs are carnivores and so should primarily (if not only) eat meat, which is a rich source of protein. 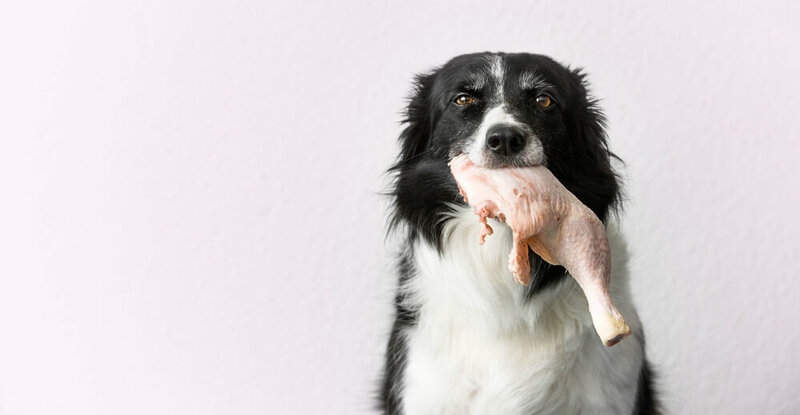 We’ve covered this topic in-depth previously, but in short, dogs are omnivores not carnivores – for most of them, a mixed and varied diet is what’s best. Either way, how much protein to feed your dog is a widely contested topic. But what exactly is protein? Why does your dog need it? And how much do they need? No matter which side of the debate you’re on, there’s no denying that including protein in your dog’s diet is essential if you want them to be healthy. Protein is made up of amino acids, the building blocks of life. Dogs can make some of the amino acids they need. But others, the so called ‘essential’ amino acids, must be consumed in the diet. That’s where protein comes in. By including protein in your dog’s diet, you are providing them with the essential amino acids they need. To put it simply, protein helps your dog to grow and thrive. It does this by, among other things, supporting healthy bones, healthy muscle tone and development and healthy nails, coat and teeth. Because of the important role protein plays in your dog’s overall health and wellbeing, there is no disputing it’s important for your dog to eat. But the debate surrounding protein hasn’t ever really been whether to include it or not – the debate has been how much of this type of food dogs should be fed. It might sound obvious, but when considering the amount of protein your dog needs you need to consider what type of dog you have. Dogs that are very active are more likely to need and benefit from a diet that is high in protein. Similarly, puppies and senior dogs tend to do better on high-protein diets because they need it to develop, grow and maintain muscle mass. Female dogs that are breast feeding may also need more protein in their diets. On the other hand, for some dogs with medical conditions, a high protein diet can actually be harmful. The goal is to provide the protein that is needed to meet your dogs daily requirements and not to much extra. Excess protein that is not needed is used for energy or excreted through the kidneys and out of the body via urine. It is not stored for later. This is an important point because protein is an expensive source of energy. It is also not the body’s preferred source of energy. Carbohydrates are the body’s preferred fuel source. The quality of the protein is more important than the actual amount in your dogs diet. Different sources vary in digestibility and content of valuable amino acids. Animal source proteins generally provide superior amino acid balance when compared with the amino acid balance supplied by plant source proteins. Whole egg provides the highest biological value, diary are second, fish is third and meat is fourth. Corn gluten, pea protein, wheat gluten etc. add to the protein content of the product but the quality is inferior as a protein source. Owners who feed their dog(s) a home-prepared diet can be selective about the type of protein they give their dog. They can relatively easily buy and prepare good quality protein for their dog. For those who feed their dog(s) a commercially prepared diet, it’s important to learn how to interpret food labels.